Cultural intelligence (CQ) could be the key to your team’s successful performance across new and diverse cultures. However, as a relatively new concept, there is a large quantity of sometimes confusing information out there... This article aims to address the most common questions you have and to help you establish a good understanding of the concept. WHAT IS CULTURAL INTELLIGENCE? ... WHY ISN’T IT CALLED ‘CI’? Cultural intelligence (or ‘CQ’) was formally introduced as a concept in 2003 (by Earley and Ang) as the ability to function effectively in culturally diverse situations.​ CQ is the reason why some of your colleagues flourish in culturally diverse situations whilst others visibly struggle. The term ‘CQ’ comes from the link with the well known concept of IQ - which stands for intelligence quotient,​thus ‘CQ’ is used to abbreviate ‘cultural quotient’. WHY DO SOME PEOPLE HAVE A HIGHER CQ THAN OTHERS? CQ differs amongst us all (like general intelligence - IQ), and has been found to be linked to certain personality traits, specifically openness to experience; how creative, adventurous and imaginative ￼￼ you are (Costa & McCrae, 1992). CQ can also be considered a cousin of the more familiar EQ – emotional intelligence; which is the ability to perceive and manage emotions. HOW CAN I UNDERSTAND MY OWN CQ? Whilst there are a number of different ways of thinking of CQ, here at the change school, we have developed the Culture Chameleon approach. As we all know, chameleons are able to change their colors to match their location, however not all chameleons have the ability to do this... some can only change to certain colors, some can only change colors to reflect their mood and some cannot change at all. What we aim to do is teach our students how to adapt their external colors in the best way possible. To do that, you have to first become aware of your natural color preferences, then the colors of your new environment, and finally how to adapt to become part of that new environment. 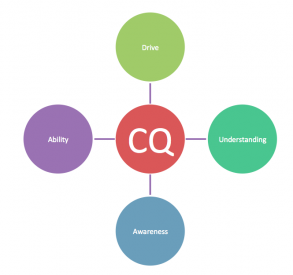 WHY DO WE NEED TO DEVELOP OUR CQ? Individuals with a higher CQ are superior performers in multicultural work groups, expatriate assignments and overseas study programs; ​CQ facilitates adjustment and optimal performance when faced with culturally diverse situations. With the world becoming increasingly globalised, it has never been more important to understand and develop our own ability to interact with individuals from different cultures. DO YOU HAVE ANY TIPS FOR IMPROVING CQ? ​When developing your CQ, the best approach is hands-on. Try putting yourself out of your cultural comfort zone in informal settings, being particularly aware of your biases, behaviours and the gaps in your understanding of others. When it comes to working on CQ, it’s also important to understand your motivation – why is it you are interested in other cultures, what are you hoping to achieve? IS THERE ANYONE THAT CAN HELP ME DEVELOP CQ? Yes! The Change School has a number of bespoke programs for individual managers and corporate teams designed to introduce and guide you through the concept of cultural intelligence with the Culture Chameleon approach, leaving you and your team with tools to navigate cultures with confidence. More about Josie: Driven to understand and bring together different cultures, Josie loves to meet people with a passion for change. Having had exposure to start-ups, non profit firms, government agencies and multinationals across the world, Josie enjoys learning about what motivates and drives people through different life paths. She loves to dive, run and horse-ride her way across the world.